Yellow Mustard & Ripped Distressed Jeans! Spring is in two day, so I thought I would kick start this season with some yellow. I am such a fan of this color. It literally looks great on everyone's skin tone. 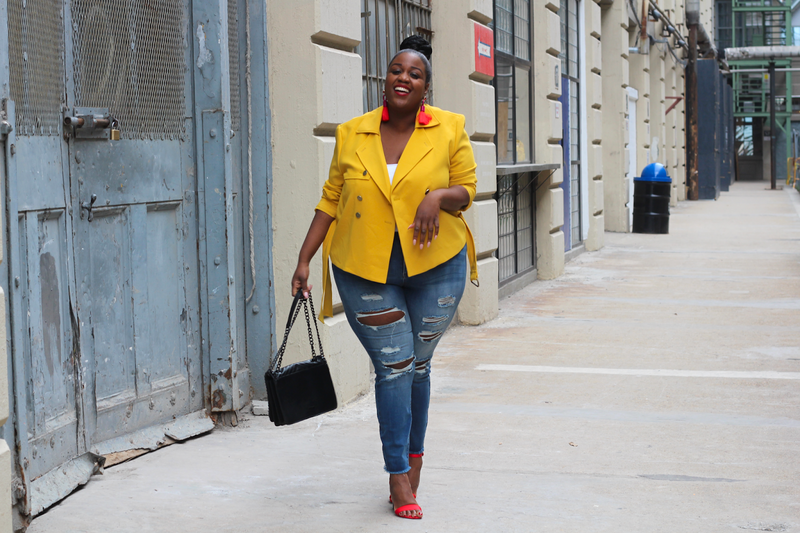 I decided to pair this gorgeous yellow jacket with red. These two colors are my absolutely favorite color combination. I also have been obsessing over high waisted jeans, especially ripped distressed jeans. This will definitely be a spring staple for me. You can literally dressed them up or down. I decided to rock these high waisted cut jeans with a pair of heels. However you can rock them with a pair of sneakers or cute colored flats. If you guys been following me on Instagram, I went down a few sizes and decided to treat myself to a new pair of jeans. 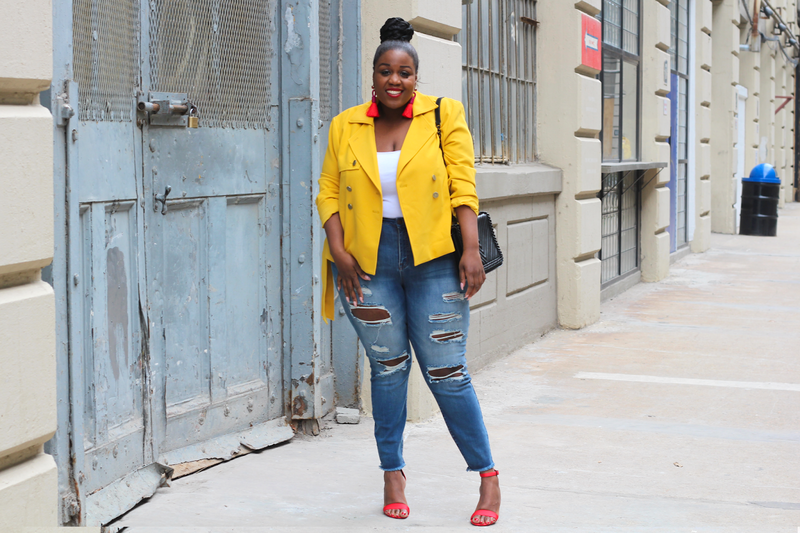 I really loved how I paired my denim high waisted ripped up jeans, and I plan to style them again. Those bright colors are so beautiful on you!! I love these 2 bold colors together- they're so playful and confident! I also love these jeans... they look like they'd be so versatile. Might have to try them myself! Your outfit is so bold and cute I love it! 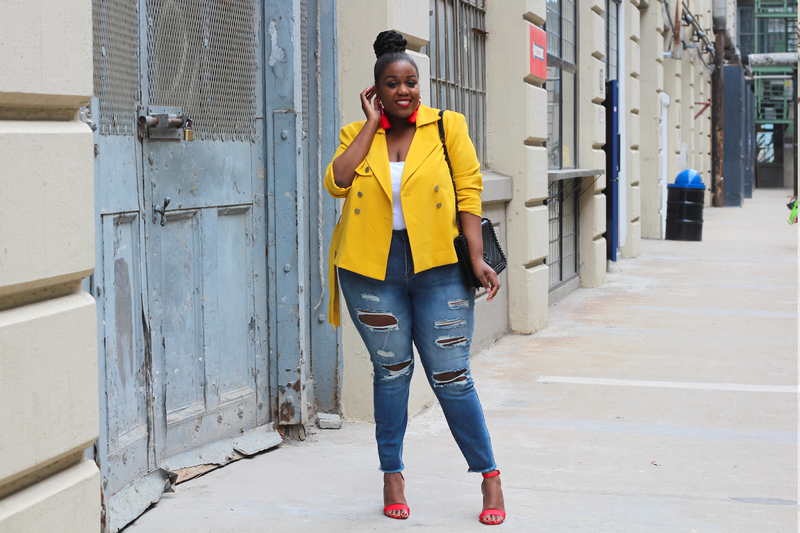 Those jeans look amazing with the yellow jacket and red heels. I am so in love with that yellow on you!!! You're killer in this outfit and I would have never thought to put yellow and red together! Genious.